When it comes to Baby Brands, there are 100’s if not 1000’s of competitors all with different products and beliefs when it comes to having a baby and all of the necessities goes with that. Summer Infant has been a brand that we’ve used throughout Mylo’s first few months and continue to do so still. Not with just a few products, Summer Infant have such an array of products that are suitable for pretty much every aspect of parenting and has everything to make that journey with a newborn, baby or toddler just that little more easy. I’ve narrowed down all of our favourites into categories and I’m starting with the most used - our Sure Sight Video Monitor has been an absolute godsend with Mylo and is the perfect video monitor for anyone who wants to get one ready for baby or is still looking for one. We never needed one when we had Millie as we lived in a one-floor flat and could hear her whenever she went to bed and/or started crying etc., but as we’re in a bigger house this time and Mylo’s room is upstairs, it was really important that we had a good video monitor to not only hear but see him too. 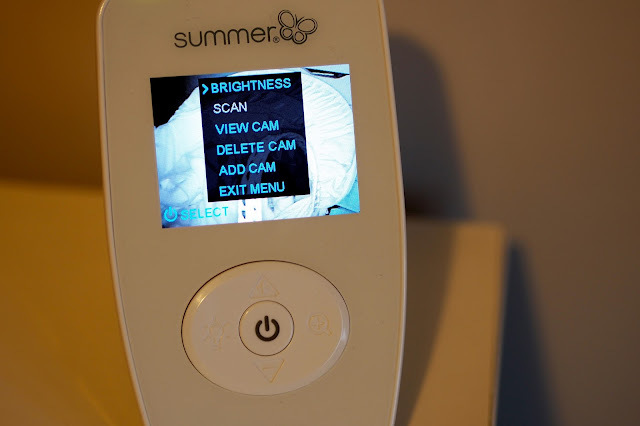 The Sure Sight monitor comes with a portable monitor in which you can turn the volume up or down, zoom in on your baby and also turn the nightlight on or off, all with the touch of a button! It requires plug in charging to be used and lasts around 16 hours before it has to be charged again but we tend to keep it on charge whilst we’re downstairs anyway unless I’m cooking or in the bath and I take it along with me. The screen resolution is great and it’s clear to make out when baby’s eyes are open or closed and using the zoom option really helps with this too! The sound is really clear and the light at the top of the monitor is fab if you want to turn the sound off but still know if baby is crying (this flashes red). The nightlight option on the camera is really good as Mylo’s room is super dark so if we need to go up, we turn that on with the monitor so we can see a little more and then simply turn it back off once we’re done. And most importantly, the wire for the camera is SUPER long! Mylo’s camera is angled at the top of his wardrobe on the opposite side of the room and there’s still lots of cable left so don’t worry if you don’t have a plug socket close - the wire should reach. It’s a great, affordable video monitor for just £79.99 and is available on the Summer Infant website or Amazon. If you love to venture out and about like we do, you’ll need some great accessories and tools to make sure your car doesn’t look like you’re en-route to a boot sale! Summer Infant have some great things to help you organise your changing bag and also your car if you’re heading on any long trips or journeys with the kids. With backseat organisers, head support and even potty training devices, there’s something that anyone and everyone can make use of! As we travel so often, whether its 1 hour trip to visit family or a 5 hour drive to Cornwall, there’s always something flying about the backseat that belongs to one of the kids and the worst bit is when Millie demands for her juice that has rolled onto the floor - it means either taking off my seatbelt and reaching for it or breaking my arm by shoving it down the side of the seat. So, these Seat-back protectors (£8.99) do a 2 in 1 job - they protect the backs of the seats from Millie’s dirty shoes (she just can’t keep her feet off!!) and also gives all of her bits and bobs somewhere to live! When we go on holiday, we fill the compartments with crayons, paper and snacks and she’s set for the journey. Mylo of course, doesn’t use his yet but it’s still on there ready and waiting. Mylo has his own little nifty accessory anyway - the Changeaway (£9.99) is a foldaway changing mat that has built in compartments for all the nappy changing bits you could possibly need! The ziplock compartment is great if you have any dirty nappies that you don’t have a bin to pop them in or even dirty clothes you want to keep locked away and then there are 2 mesh compartments that will easily fit nappies and wipes into. It all then folds in on itself and can be popped in your changing bag or kept in the car which is where ours is! Perfect if you go somewhere that doesn’t have any changing facilities and you don’t need to worry about getting wee on the carseats! Along with everything else, there are so many items for sleeping, playing and for the home too! We’ve got just a few other bits that we’ve really enjoyed using with Mylo and are still using too! The first is the bath seat! We were given this as a gift from our friends as we’d asked for something similar just from past experience with Millie being that we never used the baby baths and simply just put her in the big bath but that’s a back breaking task and so we looked for something different. This Fold-away Bath seat (£9.99) is just perfect as it means that baby is comfy and you can still get them clean but they’re also well supported. With 3 different recline angles it means that when they start sitting up you can alter it to suit and for storage, it folds flat so you can pop it down the side of the bath or the railings in your bathroom and it doesn’t get in the way! Next, it’s sleep time and the Wiggle blanket (£19.99) was great for Mylo as he loved to be swaddled but the problem was, the more he grew and wriggled around, the less swaddling worked for him so this blanket is a great transition for that point meaning that baby is secure and his/hers arms are partially secured too to stop them from moving around too much and getting out of the blanket! It’s easy to clean and to get baby in and out of too which is something we all want and need - no point in struggling with faffy blankets when a zip is perfect! And last, it’s Play time! Mylo loves sitting with all of his toys around him but the problem is, we have a dog who also loves toys and sometimes, he can’t be trusted so this Pop ’n Play Playpen (£59.99) we got from a friend is the perfect solution. It means that Mylo is not only safe away from the dog but so are his toys! It’s a quick and easy pop up pen thats portable as it’s super lightweight and can be used pretty much everywhere. The mesh sides also mean that you can still see in too and baby doesn’t feel like he’s in there alone. Mylo is happy to left in there whilst I’m cleaning or making dinner so I know that the dog isn’t near him and he can’t roll around and go far. It’ll also be perfect for when he’s crawling (we’re nearly there! ).